In almost every city, there is a go-to stop when it comes to taco places. In Buffalo, we were fond of Mighty Taco (in terms of a brick and mortar establishment) and Lloyd Taco (for food truck fiends). But in Brooklyn, that place for me has become OMG Taco, a small spot in Cobble Hill on Smith Street with a simple menu and big taste. 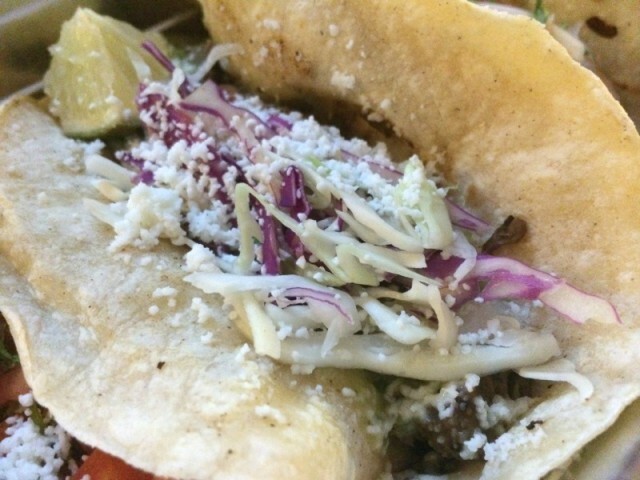 The taqueria has two locations, the one in Cobble Hill, Brooklyn and another in Bushwick, Brooklyn. For a quick and fresh meal with made to order items, here is a taste of what to expect. Looking for a quick bite for dinner on the run, the “3 Tacos” deal was the perfect way to go. For $10.95, this included a side of rice and beans and your choice of three tacos from their great selection. 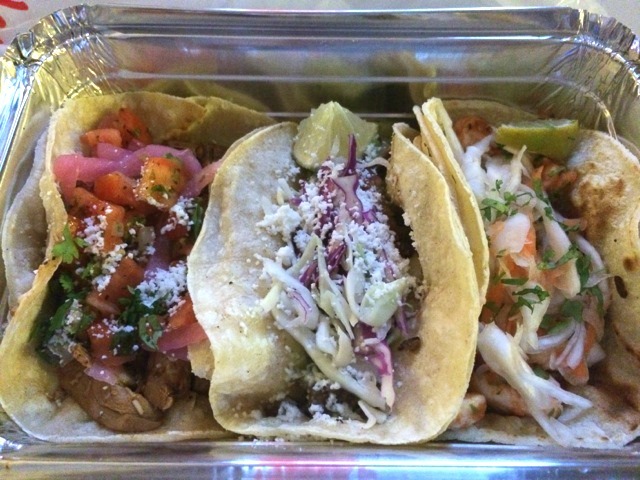 I went with the Pollo Taco (Stewed chicken), Bistec Taco (Grilled steak) and Camaron Taco (Grilled shrimp, ceviche style). 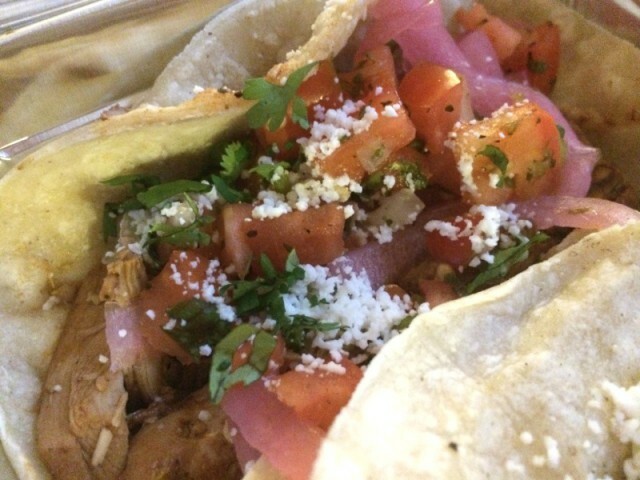 All tacos are served with pickled onion, cilantro, Cotija cheese and homemade salsa on a soft corn tortilla. 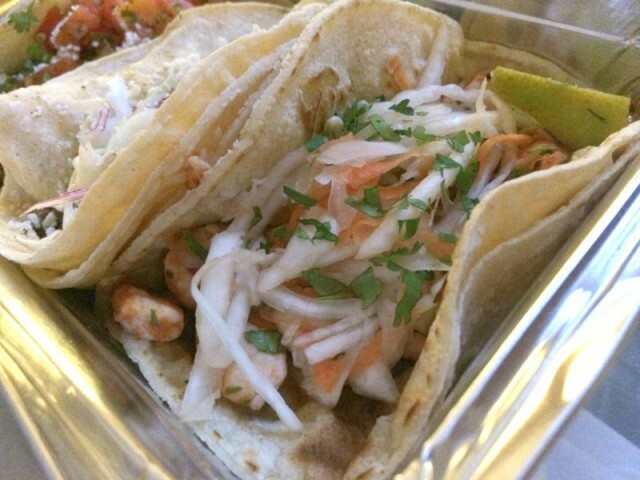 Overall, each of the tacos had a great flavor and were cooked very well. The steak ended up being the favorite choice of all three with a little kick of flavor and spice that the chicken and shrimp did not have. They were more fresh and light. A highly reccomended spot for when you need to fill your taco craving in Brooklyn. Next time we’re looking forward to trying the enchiladas and elote (Corn on the cob with Cotija cheese, chipotle mayo and chili powder). Tags: BROOKLYN, Cobble Hill, Lloyd taco, LOCAL EATS, mexican, Mighty taco, OMG Taco, Spanish, Tacos, taqueria. Bookmark the permalink.